Go pro with Gili Divers! Here at Gili Divers we have a very active and popular Divemaster education program. With some candidates always at various stages of the Divemaster course there is always company at the same level. Our Divemaster course has a strong emphasis on gaining real practical experience in the water in real world situations. 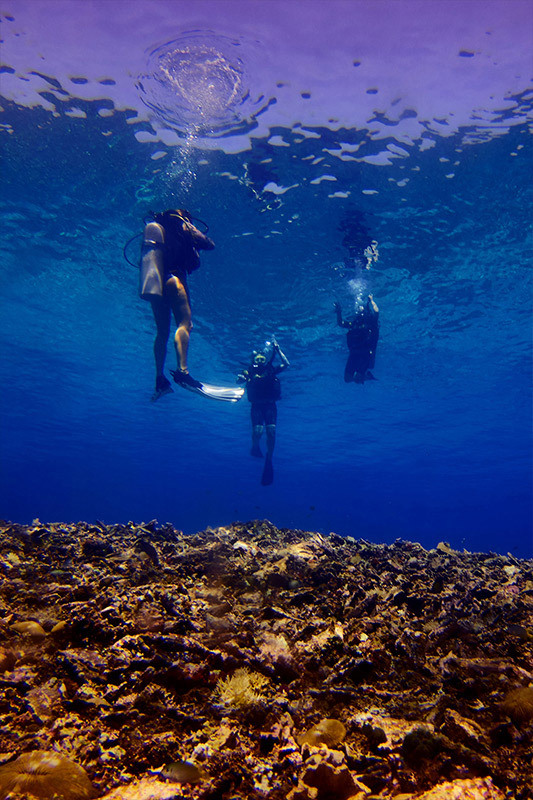 The diving environment around The Gili Islands has generally very good visibility and the water is warm all year around. However it is quite dynamic and has depth. This enables divemaster candidates to gain experience with current, drift and deep dive scenarios with 30m+ visibility, not just cocktail diving conditions. We recommend our divemaster trainees to spend as long as possible with us to gain the maximum from the course by diving alongside our instructors and divemasters. Even when the performance requirements have been met for the course candidates are encouraged to continue gaining experience until they find work or need to leave. Almost all trainees are offered work after completing the course here at Gili Divers or by other dive shops on Gili Trawangan, Gili Air or even Gili Meno. The first required achievement to start on the Divemaster course is 40 logged dives. If you don’t have the required number of dives you will complete them here on the island while you get started on the theory, refining your personal diving skills, practicing swimming etc. Once you have 40 dives logged the course will start properly, with accompanying instructors on full range of courses from introduction dives through to Rescue Diver courses. Whilst doing this you will begin with skill circuit practice and lectures ranging from physics to dive equipment. Gili Divers’ team of multinational instructors is very helpful when it comes to the finer points of theory. 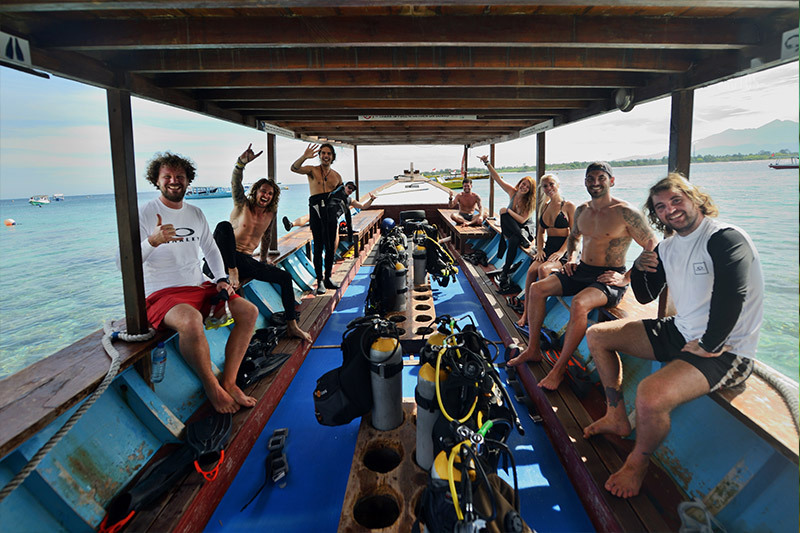 Having built experience and confidence you will begin to start supervised briefings and guiding on various courses with your instructor, in time finishing your theory and lectures and finally become a signed off PADI Divemaster or a SSI Dive Con Specialist. As a Divemaster trainee you are highly recommended to have at least your own mask, fins, surface marker and a dive computer as these are the essentials in the diving world and make your experience much easier. If you do not have these items already Gili Divers has a wide range of equipment available for you. As a DMT you will receive a 15% discount of all retail purchased through the shop. Regarding the time frame there are two different approaches for your training. The first one is a Divemaster internship style course over around 12 weeks or more. The second one is the fast track that lasts around 5 weeks. We strongly recommend the first, longer option. Finding long term accommodation here on Gili Trawangan is reasonably easy and costs around 3.000.000 IDR per month for a room with ensuite bathroom and air conditioning. When you arrive we can offer you a dive dorm for the first few days whilst you get settled in. We will also help you to find the right place to stay during your training. We offer the option of splitting the Divemaster course over 2 or 3 visits to Gili Trawangan as some people do not have sufficient time free to complete the course during a single visit. Also if for any reason the course cannot be completed, a referral will be given so you can complete the course at another location. Payment is of course adjusted to represent what you have accomplished. There are a few different ways you can pay for your Divemaster course. These include cash, credit card, bank transfer (UK and Swedish banks), paypal and Swish. PADI Divemaster course alone costs 15.000.000 IDR and PADI materials cost an additional 4.000.000 IDR. 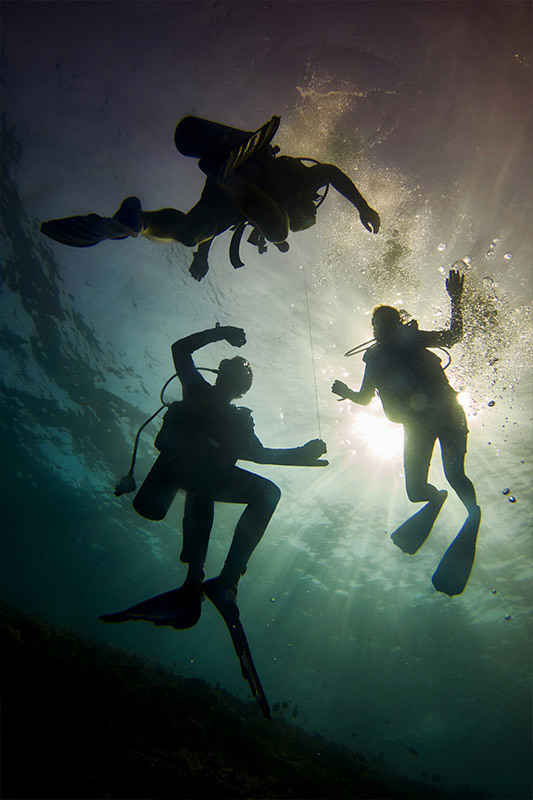 The SSI Dive Con Specialist costs the same for both the course and the materials. However the SSI course materials are all online.